Looking for the perfect gift for the cyclist(s) in your life? Check out our Holiday Gift Guide to find just the right thing! We have everything you could want to make the Holidays special. 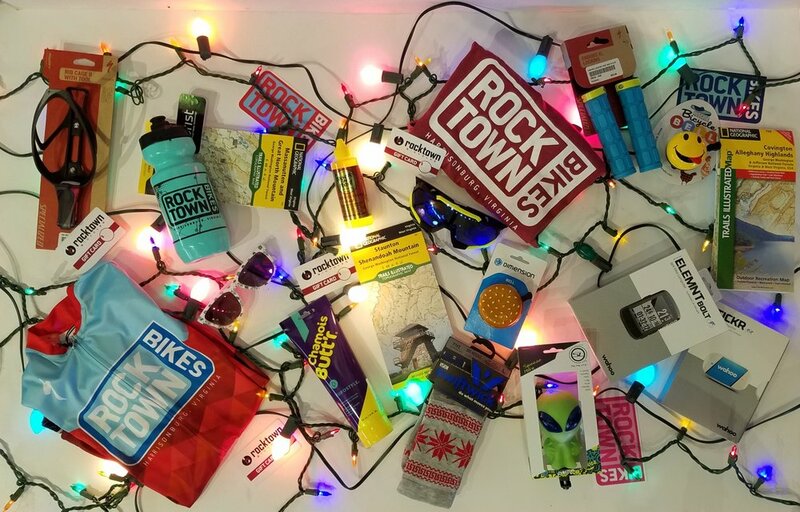 From stocking stuffers to a brand new bike, Rocktown can help you make this Holiday one to remember! Stay Safe - be bright and be seen! The BIG one! - NEW BIKE DAY! Each section is meant to highlight main items we have seen to be the most useful and fun for every cyclist. Our aim is to help you find the perfect gift without the hassle of wondering if it will be liked or used. As always, please feel free to visit the shop or contact us if you have any questions or requests. Stay Safe - Be bright, be seen, be happy! The headlights offer Wide Beam Pattern, great for seeing the road, and for cars to see you! More lumens per dollar than ever along with Niterider durability. Surprise your loved one with a bike sure to put a smile on their face. The Specialized Turbo E bikes are so fun, they make you like a kid again! We love our Turbo bikes here at the shop (I ride one almost daily around town). Specialized Turbo’s are smoother, go farther, have better support, and look better than the others. It really is you, just faster. The 3.0 sits a model up from the entry level Como 2.0 ($2,850) and has all the features we like. 29mph speed, great battery capacity, and integrated head and taillights; and just like any of our new bikes here, backed by the full support and service of our shop. Pedal Assist up to 29mph, fully integrated battery and motor, and hydraulic disc brakes! 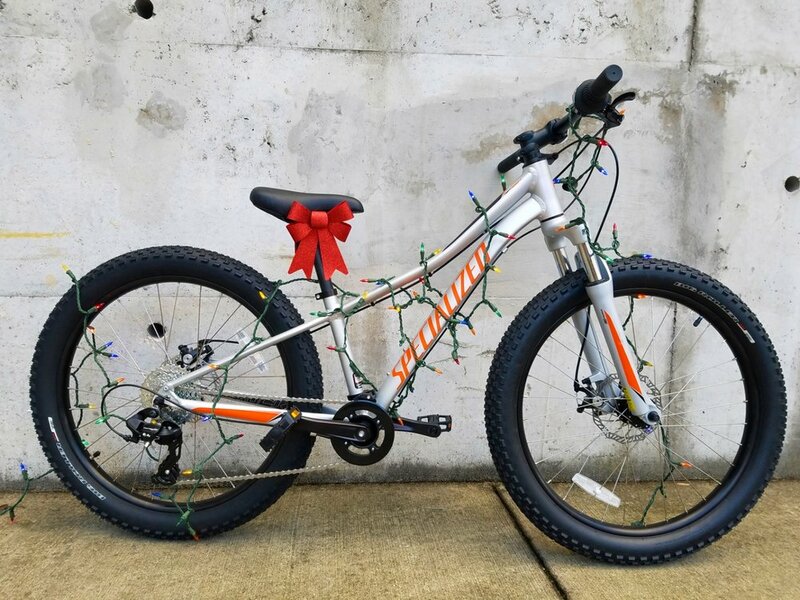 Big tires, disc brakes, lightweight tuned suspension, kid-usable brake levers, and low standover - your kid will be shredding and having a great time on the Riprock! 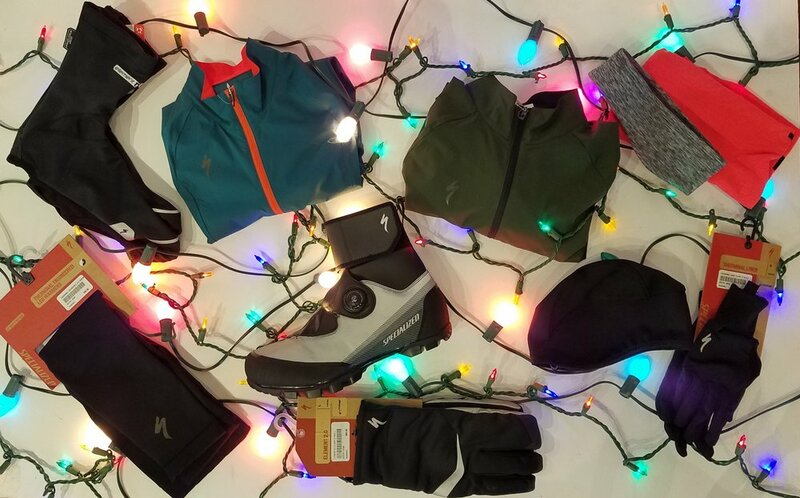 Fun Stuff - Stocking stuffers, adventure inspiration, local bike shop love! Stay Warm - Colder temps shouldn’t mean the end of the riding season. This is a super lightweight, (49 grams!) packable into a jersey pocket wind/light water jacket. Very breathable and an awesome layer to have in your pocket many days of the year. Made to ‘walk to dry’ in 30 minutes, this Polartec developed fabric is very light, very insulating, and very breathable. With a built in hood that is meant to fit under your helmet, and looks that are good on and off the bike. Super reflective, and insulated throughout. A very walkable and grippy sole made with Gripton rubber so that you don’t slip when you’re off the bike. These have been a shop favorite in the winter months. Looking for something to keep wind and water at bay but not ready for the Defroster boots? Show covers are a great addition to your winter layers and work well even for days that may just have a bit of chill to them. From lightweight to really cold, I’ve enjoyed our gloves over the years more than any other. The Element line all uses Gore Windstopper fabric which is super breathable and windproof (windproof like I previously didn’t understand). With different levels of Thinsulate in them depending on how deep of a freeze you’re riding in. Easy to get on and off and easy to keep in a jersey pocket, the latest version of these warmers fit better than ever. Necessary when it gets below certain temps and available with Gore Windstopper, the headwear we stock is warmer than ever. Mountain Bike & Road Bike Essentials - Cycling items we don’t like to live without!